U.S. Postal Service issues 'global warming' Forever® stamp? | Watts Up With That? U.S. Postal Service issues 'global warming' Forever® stamp? This just in from the U.S.Postal service. (h/t to Marc Morano) In 2014, the U.S. 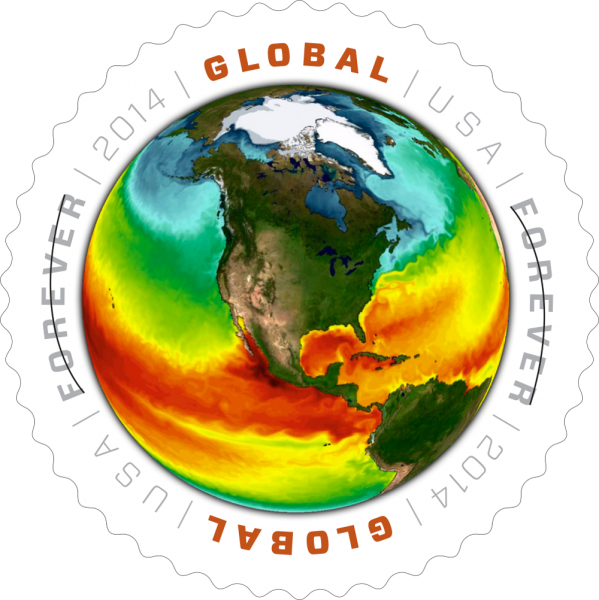 Postal Service introduces Global: Sea Surface Temperatures, a new Forever® international rate stamp. Hmmm, not only is it an oddball stamp, being round, it isn’t even of actual sea surface temperatures, it’s a model output. That’s not a real El Niño pattern you see on the stamp, it’s a simulation frame. See the “Inside the science” below. You’d think they would use one that depicts reality, not a model projection. Our current SST image looks a lot different than the stamp – no reds, lots of blues, which show our current reality to be cooler than the modeled one. On the plus side, the stamp is $1.15, so it won’t get much circulation, it might be a collectors item though in a few years. Inside the Geophysical Fluid Dynamics Lab­oratory in Princeton, New Jersey, scientists Keith Dixon and Tom Delworth and their team are busy predicting the future. Their “crystal ball” is a virtual model of Earth powered by one of the world’s largest super­computers. Working with meteorologists, oceanographers, computer scientists, biologists, statisticians, and others to manipulate the models, the team at GFDL, a National Oceanic and Atmospheric Administration center, is pushing to understand how the climate will respond to agents like volcanic eruption or industrial pollution. They use these elegant, complex climate models, whose ancestors can be traced back to the 1960s, to stage “what if” scenarios: What happens if the state of the Atlantic changes dramatically? Or if greenhouse gases continue to change the chemical composition of the atmosphere? To make a prediction — say, whether or not an El Niño is going to form next year — the researchers gather observations and start the model using a set of conditions that reflects the real world at a given time. The model isn’t absorbing ongoing, real-time truths from the Earth, per se, through a satellite or weather balloon like some might suspect. Rather, it’s using general conditions — such as the composition of land and water, and how the Earth revolves around the sun — in tandem with the great laws of physics to mimic the climate’s behavior. Millions of grid boxes tell a story about what’s happening in a particular space, interacting with each other in a dance of physics to tell a greater global narrative. The Global: Sea Surface Temperatures stamp image — one frame in a 1,460-frame (or four-year) animation — is a single snapshot of the team’s studies. To understand climate trends both past and future, the researchers must first grasp the pattern of sea surface temperatures. The two are inseparable. The ocean is a massive bank of heat from the sun and, as such, it stabilizes the Earth’s temperature, governing the seasons and stimulating changes in weather. During the 1970s and ’80s, for example, there was a severe drought in sub-Saharan Africa. Using the global climate model to investigate the cause, GFDL scientists found that shifting sea surface temperatures were largely to blame. During those decades, the temperature of the North Atlantic was slightly cooler than normal and the South Atlantic slightly warmer, causing the rains to shift southward. “Patterns of sea surface temperatures influence weather around the planet sometimes for months and even years,” Delworth says. Like the climate research it points to, the Global: Sea Surface Temperatures stamp has an international reach, covering the cost of sending a First-Class™ one-ounce letter to any country in the world. But data is of course meaningless apart from the insights of human beings — and climate researchers like Dixon and Delworth are driven toward discoveries that will speak to some of society’s big questions. Delworth says there’s been broad consensus over the past 10 to 15 years that the Earth has warmed considerably since the middle of the 20th century, that the warming is largely due to human activity, and that the warming will continue. So now the question becomes: What are the aftereffects? As GFDL’s computer power increases — and the grid boxes multiply, the global climate model growing sharper in resolution — the answers in the swirling globe will likely become ever clearer. June 5, 2014 in Global warming, Government idiocy, Sea Surface Temperature. Comes with a free blu-ray of the Cosmos series. Ludicrous lies passed as being truth. An entire generation brainwashed by it’s government and public indoctrination centers, aka public school system. Better the Postals go Alarmist than the reverse. Is there a worse omen for alarmists than to have the USPS put their stamp of approval on global warming? Well, at least they show an ice cap. And I would guess that most people who still use stamps, won’t get the subliminal message anyway. Makes the “Posties” feel like they are sending a message but it’s like sending a message in a bottle free in the ocean. Odds are, most people won’t see it. We don’t need thermometers anymore. We need pollsters. Ahh, but is it “robust”? Yikes, it’s not the Onion. Who, for chrissake, got the idea that a postage stamp should be…round? Is it the same person who’s going to put square tires on postal delivery vehicles? I’d say crucify (no I’m not EPA) them for this. For the blatant overuse of removable backing (or whatever they call it) to accommodate round stamps (the most inefficient shape) to a sheet. Remember, there’s going to be millions of these stamps. How much additional landfill will be used up by the discarded backing to these stamps? What about the additional energy consumed transporting the additional square acreage (Manhattans, anyone?) of backing paper these stamps require? What about the children, struggling to determine the placement of a round stamp on a card to grandma? What about the asthmatics (ok, skip that one)? Now, I know that all sounds silly. But isn’t that sort of the point? One thing that does sort of give me the creeps however is how all the logos from the myriad government agencies are systematically assuming round shapes, a little like a certain campaign logo for the ‘One.’ And, now a round postage stamp? Eeeuh. I’ve seen it all now! To think that the CO2/warming science was launched by a guy with a high school diploma from a rural farming area in southern Manitoba after he got himself into the UN and created UNEP, the UNFCCC (Framework Convention on Climate Change), Agenda 21, the Rio Summit……Am I talking about Dr. Evil? He’s sucked in the big boys- the elites of industry like Gates and the usual guest list at Davos, Switz. mtgs of the mighty. First class work from USPS. Together we can lick this global warming. This is ‘full spectrum dominance’ at work. Since our government has decided that global warming is the #1 issue after Putin (HAHAHA) then EVERYTHING has to be global warming propaganda all the time and so it is. Then I suppose we will invade Russia in time for a brutal winter a la 1812 or 1942. Yes, most likely. More likely Russia will invade the purposefully weakened US. What’s a “stamp” used for? I’ve heard of elephants using stamps to flatten annoying cartoon animals. It’s fitting that this is a Forever stamp — the worst possible economic model for selling a product or service, wherein the seller locks in a price irrespective of any future increase in costs of delivering that product/service. So, the folks who can figure out how to make a government monopoly actually pay are going to tell us about climatology? Sounds legit. This will really stick it global warming. A map without a legend is propaganda. The global IQ test is now about complete. I do so like non-retractable evidence of this scam. A forever stamp fits that description perfectly. So don’t buy the stamp make up the price if you need to with different value stamps. Your postal service will be left with a large inventory of crap stamps. US based sceptics should unite and boycott the stamp. It’s all in the color scale. Note that the red is below 30°C, say ~28°C? And just above 0°C, the color is black. Obviously people won’t notice the cold but will see the warm. Wow, the stamp of the computer game! Well, collectible demand would go through the roof if they dropped in one of Al Gore’s infamous mirror-flipped storms, particularly if it was named “Hurricane Jenny”. What do “anomalies” have to do with the stamp? They are showing absolute SST. Furthermore, given the east-west equatorial detail, it appears to be a day’s snapshot reading rather than a month’s mean. But is it real snapshot? Not enough ice for June or early July. The Northeast Passage (north of Siberia) is either about to open or recently closed. The Northwest Passage looks open. But the Atlantic tropic temps do not look like the depth of the hurricane season. Are the tropics cool enough for it to be November with the Ice Cap growing after minimum? Or is it a fiction? You’all are missing the point. The USPS sells different stamps representing different groups because it creates revenue. What better way to use global warming to tap into the pockets of the believers and do gooders. Not really the case here. Because of insane price increases of less than 5 cents at a time, a specifically priced stamp has to be used with a variety of small denomination stamps to equal the current rate. So now they can stop producing those small 1 and 2 cent stamps. It also makes sense that a postage increase does not require a new stamp to be produced while the old, unsold denomination stamps sit useless in postal warehouses. And it makes postage increases less objectionable as there is no need for people to go out and buy the new priced stamps with each change. “The Post Office Department, a branch of the Federal Government, recognizes” that the Arctic Ice Cap is FOREVER. Ask our British friends, it was they who started it. Seriously bro? You expect a government entity to depict reality? Are you new here? USP decides its not forever- nicely crossed out. Is it USA or Global?- we cover both bases. Oddly, “forever” is struck out on the stamp. A model is a machine that spits out answers according to the way it has been built. It’s connection to reality is tenuous. It can learn nothing new. To treat its output as what WILL happen instead of what MIGHT happen is circular reasoning; so one has to wonder what one would gain from experiments with it as you will only get what was expected in the first place. FYI the word “forever” is struck out on the stamp to prevent it from being printed and used as is as a stamp. I know, pretty lame security, but then this is the government at one of the lowest civil service levels. Snap ’em up. The way the money supply has been “managed” over the last few years, the value of the stamp should increase substantially. At the very worst, it will be a much more attractive curiosity than a share of Fannie or Freddie. Who said they will fundamentally change America? Stamps included? Right, I’m going to buy at least two sheets for future reference. The colors are pretty, although I do prefer blue so I’ll await the next issue in 5 years before I frame them together. Forever stamps are a boon to postal patrons. Other than that, only 1 in 783,246 patrons are expected to actually examine the stamp’s artwork and only 78 of those patrons will have a clue what the image represents, with 97% of those agreeing that something must be done. So they manipulate the models into doing what they want. But the models are elegant on the catwalk. Indeed just more proof CAGW is an intelligence Test. Naturally the Postal Service will buy in, they did after all bring us the expression; Going Postal. @ TomJ It doesn’t matter what it costs, only what it makes. So… is this the result of the USPS coming up with what they thought would make for a good stamp? Or is this the result of the Obama administration gently nudging the USPS into doing this as part of their over all campaign to instill fear of climate change into the American subconscious? I will readily admit that for the vast majority of my life I would have dismissed such a thought out of hand. I would have branded the notion the stuff of conspiracy theorists run amok. Having watched the debate disintegrate from poor science to complete, blatant, and utter spin doctoring, in conjunction with an administration for whom the mock “reset” button spelled incorrectly in Russian and given to Putin as a gift now appears to be one of the less notable gaffes, I’m not nearly as certain as my younger self would have been. Love the reference to “these elegant, complex climate models”. No suggestion of accuracy, but just look how elegant and complex they are. Mmm, fluffy. The reason why “your” color map looks so different is because what they show is sea surface temperature, and what you show is SST anomaly. The US Postal Service does seem to be modeled from a careful study of what would be a profitable and efficient business model, then it was decided to do the opposite as it would be a state-owned monopoly thus the opposite of capitalism. For about half the cost of a candy bar for a simple envelope, they will transport it across a continent, drive many miles and walk many blocks through severe weather, and drop this item of perhaps tremendous fiscal, governmental, and/or personal significance, into an unsecured box where it might be partially protected from the elements, where it is solely protected from thievery by a sternly worded federal law. For the additional cost of a week of groceries a year, you get a secured metal box at a central location where your mail is protected, with access during limited daytime hours, and the postal service reaps the savings of centrally delivering the mail for thousands for less cost than in-the-field delivery for ten, in less time without the added vehicle costs. Why not just let me use a centrally-located secured box for free, and charge more for the direct delivery? If it’s important enough to them to send it to my residence rather than wait until I pick it up in town, the sender should have to kick in a few bucks for an added delivery charge. It’s only fair. How about an Elvis stamp? I wish they would make a 25-cent Michael Mann stamp, for their “Heroes of Climatology” series. Then someday I could scrape the two-bit “Nobel Prize winner” off the sole of my boot. Models on a catwalk are nice. But when it comes to models I prefer full disclosure. It is important to verify models are not hiding anything anywhere. Just how good is their computer model if it does not take into account things like the coriolis effect on ocean currents? Looks like warm water is creeping *up* the west coast. The USPS does not issue stamps of someone who is living. Maybe the next stamp will be a hexagon and depict one of those solar road panels. FYI – International Forever stamps have been round since they came out, and the price is in line with the increases in recent years. Those of us who do mailings are happy not to have to add supplemental postage all the time. Nice stamp—for $20T big ones and science fraud in the process. How about a half naked bust of Marilyn Monroe on a stamp. She’s dead. She’s a lot easier on the eyes than Michael Mann. One of them is almost bound to be nearly correct, since they vary in all conceivable directions. Yet you’d think, wouldn’t you, that if these models had ANY credibility, that they would all be more or less the same path of variations. The fact that they do not, shows what a load of old cobblers they really are. If it does turn out to be a full blown Modoki, then the US Postal Service has made an even greater blunder than is described in the above article. Maybe they should stick to ex-Presidents, and other famous Americans of note, like Thomas Edison, Henry Ford, Mohammed Ali, etc. Regulating the use of coal fired power plants in America, while shipping American coal to China, where they are building two coal fired plants a week, only increases the price of electricity in America. And building failed alternative energy plants in America only enriches the political cronies of Obama and allows the Chinese to purchase the bankruptcies for pennies on the dollar. The EPA should acknowledge that scientists that originally proposed the global warming hypothesis have recanted and say the Earth has been cooling for the last decade. And by the way, the Earth had hot and cool ages prior to the rise of man. The real foundation of the global warming mantra is the trillions to be made in setting up and operating hot house gas commodity exchanges and the consequent global redistribution of wealth. Legitimate scientists suggest sun spot cycles have more to do with global climate change than all the works of man.